From squirrels to raccoons, employees at the Humane Society of Macomb Animal Shelter never know what may be brought through the doors. In August, a good Samaritan found an animal outside, but wasn’t quite sure what it was. She managed to catch the animal in a box, and brought it to the Humane Society of Macomb Animal Shelter. The woman informed shelter staff that the animal might be an opossum, so extra precaution was taken when the box was opened. The staff was very relieved when the animal turned out to be a Sphynx cat – an exotic hairless cat. A staff doctor examined the cat, later named Fancy, and estimated her to be about 5 years of age. Upon physical exam, the doctor found her to be in good health. She did, however, notice that Fancy’s gums looked very red and inflamed. Fancy was scheduled for a d ental, and possible extraction of teeth. The doctor performing the dental extractions determined Fancy had Feline Oral Resorptive Lesions. FORLs are very painful lesions on the teeth. The teeth begin to erode, and the dentin and pulp cavity (containing the blood vessels and nerves) are destroyed. This causes the cat to experience pain and difficulty eating. FORLs are a common condition among cats. Between 20 and 60 percent of cats will have a FORL during their lifetime. Signs of FORLs include redness and swelling at the gumline, as well as loss of appetite, chewing food on one side of the mouth, or swallowing kibble whole. 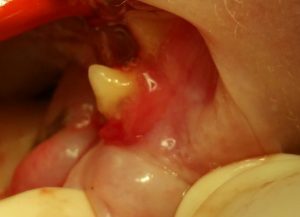 The cause of FORLs is unknown, but the only treatment of the lesions is removal of the affected teeth under anesthesia. Fancy was placed under anesthesia, and following a cleaning of the teeth, had two teeth with FORLs removed by the doctor. Now that the pa inful teeth have been removed, Fancy is expected to enjoy a comfortable life. Her new owner will need to monitor her eating habits, and have an annual exam performed by a veterinarian. 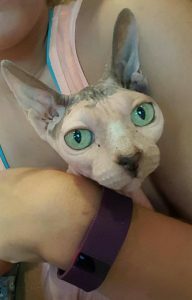 Though some Sphynx cats have a small amount of fur, some are completely hairless. Because of their unique skin, they require special care. The cats need to be bathed at least weekly, as oils normally absorbed by cats’ fur builds up and must be removed. Extra eye and ear care is also required. Special attention should be paid to temperature, as they are susceptible to heat or cold sensitivity. Fancy has recovered well from her dental, and was adopted shortly after she was ready for adoption. Though she requires a little more attention than cats with fur, Fancy is sure to provide her new owner with love and affection. The shelter has many pets available for adoption. Visit the shelter and find your new best friend!